Are Mets phasing out Carlos Beltran? Last night on "Mets Hot Stove," Kevin Burkhardt interviewed the Mets' "starting outfield": Jason Bay, Angel Pagan and Jeff Francoeur. At one point, it was predicted that since Pagan had 11 triples in little over half a season in 2009, he could get 17 triples this year. During the entire segment, nobody said a word about Carlos Beltran. Last year, the Mets grossly underestimated injuries. Everyone was day-to-day, up to the point where they were being wheeled into the operating room. Maybe they are going in the other direction this year - assuming Beltran is out indefinitely and cannot be counted on for this year. Or maybe Beltran is out indefinitely and cannot be counted on for this year, rather than coming back around early May, as has been previously speculated. Unfortunately, the Mets have such little credibility when it comes to communicating on injuries that it is impossible to know what to believe. Meanwhile, Jerry Manuel is planning dramatic changes to the lineup - batting Jose Reyes third - just until Beltran comes back. Or is it quietly planned to be a permanent change? The worst-case scenario is that Beltran is more seriously hurt than the Mets are letting on. Pagan was a pleasant surprise last season, but he is no Beltran, either at the plate or in the field. Burkhardt asked Bay and Francoeur how long it would take for the new outfielders to get used to each other, and the corner outfielders joked that they would let Pagan go after all the flies. That joking around makes a lot more sense with the Gold Glove-winning Beltran still in center, instead of the guy that almost ran into Beltran last May and helped cost the Mets a game in L.A.
Beltran is entering the next-to-last year of his deal. He is battling injuries. The Mets have criticized him and his agent over the handling of his surgery. And his agent is Scott Boras. Perhaps the Mets have already decided that they are not going to re-sign Beltran. Depending on how Beltran comes back from his surgery, it could be the right decision. But with two seasons to go, the Mets should be hoping that Beltran plays well enough to merit re-signing, not looking forward to life without him. I reviewed the Mets' hot stove season for Baseball Reflections in a piece called "Mets Hot Stove Roundup: The Pilot Light Is Out." I discussed how the Mets went into the offseason with many big needs: No. 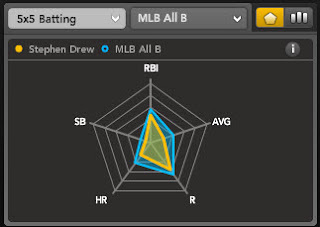 2 starter, power-hitting leftfielder, catcher, setup man, and upgrades at second base and on the bench, and managed to successfully fill only one of these needs. After I finished the piece, the news broke about Rod Barajas. So I feel slightly better about the offseason, but Barajas is not a Met yet. And if I'm getting excited over a so-so 34-year-old catcher, that probably says even more about how the offseason has gone. Is Omar Minaya finally heeding Casey Stengel's advice? Casey Stengel once said, "You have to have a catcher because if you don't you're likely to have a lot of passed balls." Stengel was attempting to justify the Mets' selection of 31-year-old perennial backup catcher Hobie Landrith as the team's first choice in the expansion draft. The previous year, Landrith had hit .239 with two homers and 10 RBI in 71 at-bats for the Giants. Only an expansion team could be reduced to attempting to fill a key position with such a player. Or so we thought. As of now, the 2010 Mets have no starting catcher - only, as one scout says, a bunch of backups. So far this offseason, Omar Minaya has acquired 21st-century versions of Landrith - Henry Blanco, Chris Coste and Shawn Riggans - to battle with Omir Santos, who should be a backup, and Josh Thole, who probably needs more seasoning in the minors. But now there are reports that the Mets are pursuing free agent Rod Barajas, who actually has been a starting catcher the last two years with Toronto. Omir Santos hit .260, but he can't match Barajas' power numbers. More importantly, Barajas is much stronger defensively. Signing Barajas won't exactly be the equivalent of trading for Gary Carter before the 1985 season, but it would at least give the Mets some credibility behind the plate. Does Scott Boras need to get his groove back? I'm on a roll. I just wrote something for The Faster Times about Scott Boras, and how he didn't exactly have a postseason to remember. Please check out my article. In other news, the snow continues - again - on Staten Island. It's been snowing since late last night. I've had enough of winter, thank you very much! 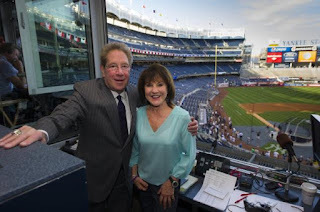 I'm about to go on the radio this afternoon - I'll be on WRAM 89.3 (SUNY Farmingdale) on Kenrick Thomas' show to squawk about the Yankees. Go here to listen live - I should be on around 12:35 p.m. The Yanks haven't even made it to spring training yet, but already I'm sick of all the rampant speculation about what's going to happen when Derek Jeter's contract is up at the end of the year. , and Jeter's star will be significantly dimmed if he goes elsewhere. Brian Cashman has said he won't negotiate with Jeter, Mariano Rivera, and Joe Girardi until the 2010 season is over, which makes perfect economic sense. But it also means we're going to have a year of speculative articles like the one Tyler Kepner recently wrote for the New York Times about Jeter's contract. Kepner's angle is that "the value of the [next Jeter] deal will also reveal something about Jeter and his true feelings about [Alex] Rodriguez." Huh? Then Kepner wonders, "Will Jeter demand a contract that also takes him through age 42? Will he seek to make more than Rodriguez?" Um, on what planet is Jeter going to get a contract guaranteeing him more than the $27+ million a year A-Rod makes? Heck, Rodriguez himself wouldn't get that money now, thanks to the bad state of the economy. Besides, Derek couldn't get a deal making as much as Rodriguez when he was 26 years old, but he's going to get it at age 36? And get such money up until age 42? Gimme a break. Anyway, as Jeter said when signing his previous deal in 2001, "being the highest paid is not something I covet." But he's going to all of a sudden play hardball and demand to be paid more than A-Rod? Come on now. Jeter's not going to ask to make more than Rodriguez - the captain is not stupid - and it's silly for Kepner to even speculate on it. But, since the writer is invested in making the Jeter contract negotiations "a new act in the always captivating Jeter/Rodriguez psychodrama," we are treated to all sorts of psychobabble, like Kepner noting that "in general terms, Rodriguez makes things complicated and Jeter keeps things simple." Gee, you think so, Tyler? Who knew! But for all the cliched comparisons that the Times writer makes between the two players, he misses a very significant point - thanks to A-Rod, Jeter ended up with an extra $70+ million the last time around. So what about Jeter's future? I am very confident he will stay a Yankee for life, and remain where he belongs. If he goes elsewhere in free agency, he will make a mockery of his reputation. It's just not going to happen. He's not Brett Favre, after all. 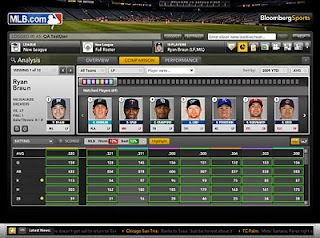 The fantasy product offers a wide range of data that can be viewed using the sorts of graphs and charts familiar to users of Bloomberg's financial products. The product also offers a feed of links to news stories on players that you can customize to select players on your fantasy team or those you are watching in advance of the draft or during the season. The main data unique to Bloomberg is the B-rank, used to give each player an overall ranking. The algorithm used is proprietary - kind of like Bloomberg's secret sauce. The fantasy product comes in two parts - a draft kit, which is $14.95, and a package for tracking playeres throughout the season, which is $24.95. Both pieces may be purchased together for $31.95. Squawker Lisa and I will be getting a free home trial of the software later in the month, so we will get a much better idea then of how valuable it would be to the fantasy player. Bloomberg also hopes to market this package to the non-fantasy player, but the data-heavy package does seem more tailored to those in fantasy leagues. Also part of the demo was the pro package, which is not simply an advanced version of the consumer product, but an advanced look at a whole range of stats that would not be relevant to most fantasy leagues, but are valuable to real teams. The demo included stats such as how often a player swung and missed at different points in the count, as well as what parts of the field players hit the ball. When the Mets claimed that Jason Bay was a better fit than Matt Holliday for Citi Field because he pulled the ball more, they might well have been using this package to come to that conclusion, since all the teams have been given a free trial of the package through Bloomberg's partnership with MLB. The pro package looked impressive enough for the demo that I am now worried that, once the free trial is up, the Mets will be the only team not to buy it, claiming that they are saving their money in case other packages become available in midseason. While at the event, Lisa and I had the chance to meet some of our fellow bloggers and baseball writers, including Mike Silva (www.nybaseballdigest.com), Mark Healey (http://www.baseballdigest.com), Jay Gargiulo and the guys from (Fack Youk), Amanda Rykoff (http://ocdchick.com/), Ken Fang http://www.fangsbites.com/, Jenn from Phillies Phollowers and ESPN fantasy writer James Quintong.